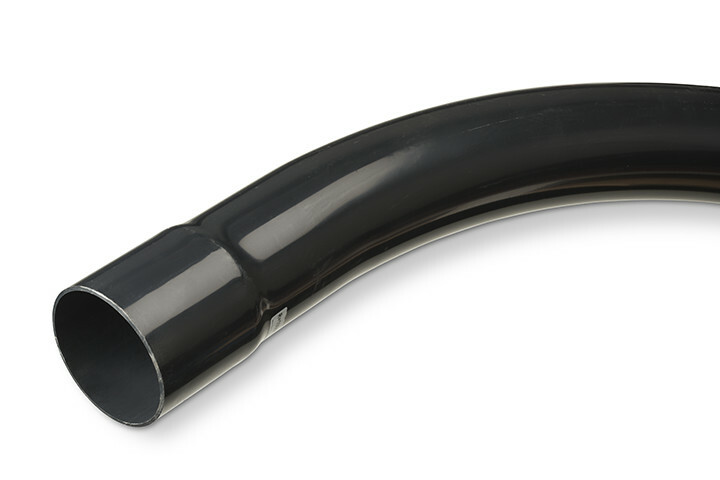 To create a bend with a ridged PVC, PE or PP tube for the purpose of easily feeding through your cables and pipes, Electroplast supplies high quality moulded plastic bends. Owing to the special production method, the bends have a very precise diameter and are very stable. moulded bends can quickly and effortlessly be installed as a connection between various types of protective plastic tubes underground. Production in accordance with EN 9001. Available in PVC, HDPE and PP. 50 to 200 mm, the radii from 500 to 3.000 mm and the angles 15°, 30°, 45° and 90°. We supply our moulded bends unilaterally with a standard sleeve or a sleeve with a rubber sealing ring. the other end of the bend has a pin shape. Do you have specific requirements for radii, wall thicknesses, and degrees? Then please contact us.